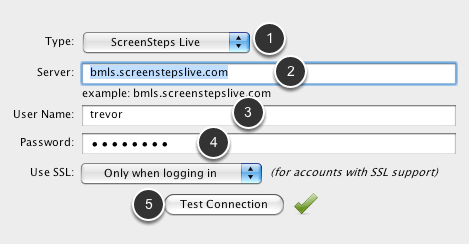 Shows how to quickly download ScreenSteps 2, create a ScreenSteps Live account and configure ScreenSteps 2 for publishing to ScreenSteps Live. Go to www.screenstepslive.com/signup. Choose an account type and select Sign Up. Create an account. An email will be sent to you to activate your account. Click on the link to activate your account. Click on the "+" button at the bottom of the window. Select ScreenSteps from the drop-down menu for the account type. Enter your server url. This will be the account name that you created when you signed up. It will normally look like youraccount.screenstepslive.com. Click Test Connection. If you get a green check-mark then everything is configured correctly. If you get a red x then please make sure that you have entered the information correctly and try again. With a ScreenSteps Live account you can publish individual lessons or complete manuals. 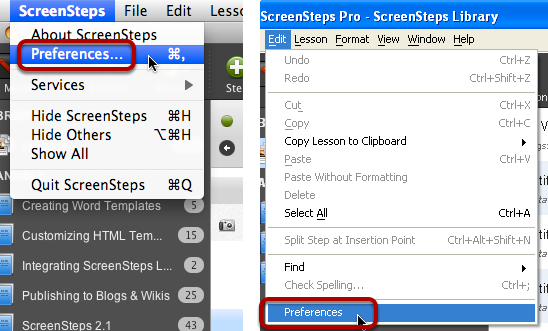 For complete details on how to work with ScreenSteps Live please see the ScreenSteps Live manual.